Swabian-Hall Pigs originating from Schwabisch Hall in Baden-Württemberg, Germany. They are a large pig, white in the center with a black head and rear and narrow grey bands at the transition from white to black skin. 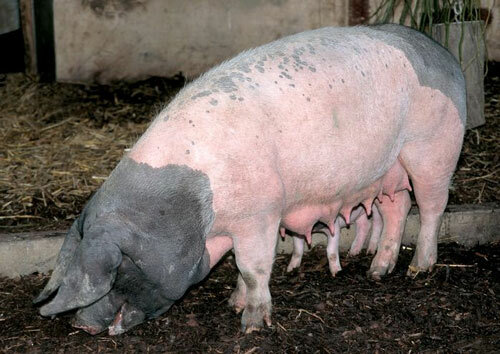 They have large litters averaging more than nine piglets. They are the result of King Wilhelm going to China and obtaining Meishan Swine and then crossbreeding them with Russian Wild Boar that was indigenous to the country of Germany. He did this because the indigenous pork was too lean and too dry, much the same as the current confinement, heavily muscled, super-lean hogs in the U.S. Swabian-Hall meat was named the world’s best pork in 1832, and then again at the 1892 Worlds Fair.